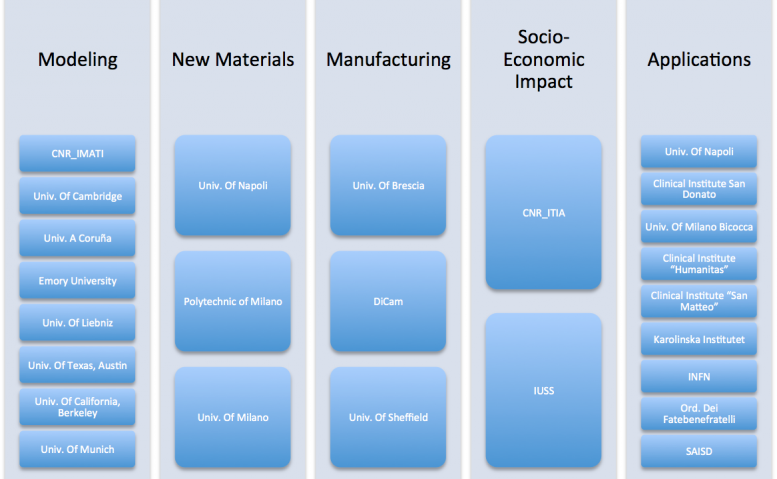 Here below are reported the Italian Universities and Research Centers which have collaboration activities in relations with the 3D@UniPV project. The project involves a total of 6 Italian Universities, 2 Research Centers and 3 Hospitals. Development and characterization of material and development of technologies for the “Print your house” project, in collaboration with WASP enterprise. The project aim is the realization of a 3d printer, able to print building elements up to entire houses, using materials natural and local as much as possible. Development of patient-specific model in cardiovascular field. The project starts from the analysis of volumetric radiological images, like CAT (computed axial tomography) and MR (magnetic resonance), for the extraction of the anatomy of interest to get to the prototyping of the model. The prototyping of the model use both rigid and deformable materials able to reproduce mechanical specific characteristics of the patient, thanks to the elaboration of 4D CAT. Thanks to the collaboration with the unit of Vascular Surgery II of IRCCS San Donato, in addition to CNR-IMATI of Milan, was established the β-lab (Biomechanics for Endovascular Treatments of the Aorta). Always with the unit of Vascular Surgery II is in progress the iCardioCloud project funded by Regione Lombardia and Cariplo Foundation. Development of metal 3d Printers. The collaboration on the issue of rapid prototyping between the Department of Mechanical and Industrial Engineering and the University of Brescia in the Strategic Plan proposed by Prof. Elisabetta Ceretti, is currently being defined. Development of a fluid dynamic simulator used for in vitro tests of prosthesis in the vascular patient-specific models prototyped in silicon. In addition to the unit of Vascular Surgery II of IRCCS San Donato, CNR-IMATI is one of the members using a lot the rapid prototyping in the experimental activities, for the creation of both patient-specific models and laboratory instrumentation. It’s also one of the members that has permitted the born of β-lab that is dedicated to the study of vascular fluid-dynamic. Thanks to the activities carried out in collaboration with CNR-IMATI and CNR-ITIA the Fab@Hospital project was funded within the flag projects of CNR, that are focused on the use of rapid prototyping for the production and in vitro tests of patient-specific implants. Development of a business model for integration into hospital realities of rapid prototyping technologies for the production of prostheses and anatomical models. The collaboration on these issues is always conducted as part of the Fab@Hospital project mentioned above. Development of low-cost solutions for rehabilitation and disability support, based on 3d printing. Microgravity simulation to test the biological use of 3d printed materials in similar space conditions. Use of 3D polymeric printers to create micro-fluidic circuits.